Showing results for tags 'harley davidson'. I’ve been wondering for a while what on earth Creator Expert 10269 is going to be, and as I could find barely anything about it, I thought this thread would be the way to find out more. 10269 (Vehicle D2C Set) is described on Brickset simply as that, with absolutely nothing else to tell us what it is. Does anybody know anything about it at all, apart from ‘vehicle’ and ‘creator expert’? It could be a train, a car (though unlikely as the Ford Mustang has just been released), a plane, a ship, a shuttle or something completely new. The only thing I can possibly think of is an Emerald Night 10th anniversary rerelease, though I can’t see why they would do that. Please share your thoughts on this set below. 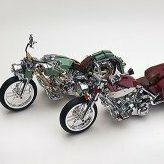 Currently I am working on a new Lego project (large scale Duesenberg SJ) and while waiting for a few exotic parts I decided to update my small Harley Davidson collection with a model I have had in mind for a while; a custom softail with classic springer frontend. The colors and plated parts are inspired by the Chicano style lowriders I often admire in Magazines. I just love these wild rides with an extreme attention to detail. These types of bikes can be seen with fantastic artwork and completely engraved engines and accessories. This 1:10 model has many customized parts as well. All Lego ABS parts are plated with true chrome and gold, at an industrial ‘plating on plastics’ factory. Some Lego parts cannot be electro-plated (non-ABS) and are therefor sprayed, like the Technic connectors and 75 mm front wheel. Silicone cables are used for the front brake and clutch cable. I nicknamed it “last of the wilds” as it will probably take a while before I have time to build a new one. Hello, Eurobricks Technic, Mindstorms and Model Team! I have been without internet for some time, and just logged into Eurobricks again. I cannot embed an image, so here is the image location on postimage org: I am Kieran Chamberlain, and I present to you a rendering of a Harley Davidson custom designed using LDD that I will be building soon. It is my first LDD to POVRAY rendering, and uses the default render settings. The tyres in the render are for representation only, the real model will have tyres synthesized from pnuematic tubing, etc. 98% complete, It comprises a heady 3000+ parts at 65cm length, with the following functional features: -45 degree single cam V-twin engine with two pushrod operated valves per cylinder -Front and rear brakes with hand and foot controls -Springer front suspension -Foot gearshifter with nuetral and first gear -9v motor in gearbox, battery pack disguised as oil tank -Steering Enjoy!